Besides Easter, this is a sewing weekend. 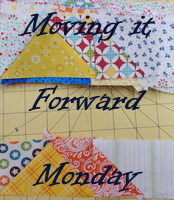 Join Sugarlane Designs for their Friday Night Sew-In which is lasting ALL WEEKEND!!! Sign up and join the fun! 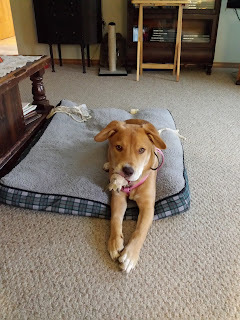 I promised some pictures of the newest member of our family. Not sure if I remembered to do this earlier so figured this was as good a time as any. 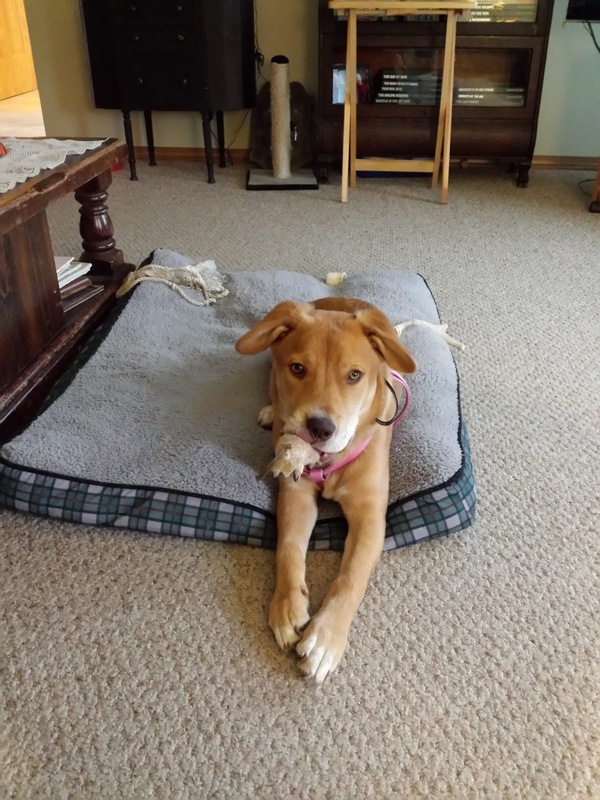 Meet Gracie, a lab mix. She will be 6 months on April 2. The other day I went up the stairs to this mess. Gracie had so much FUN but I was seeing RED!! 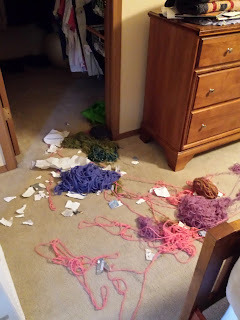 It's taken me nearly 3 days to get the balls of yarn untangled and rewound. I think I'll wind them into cakes this weekend. Then all will be stored well out of her reach. 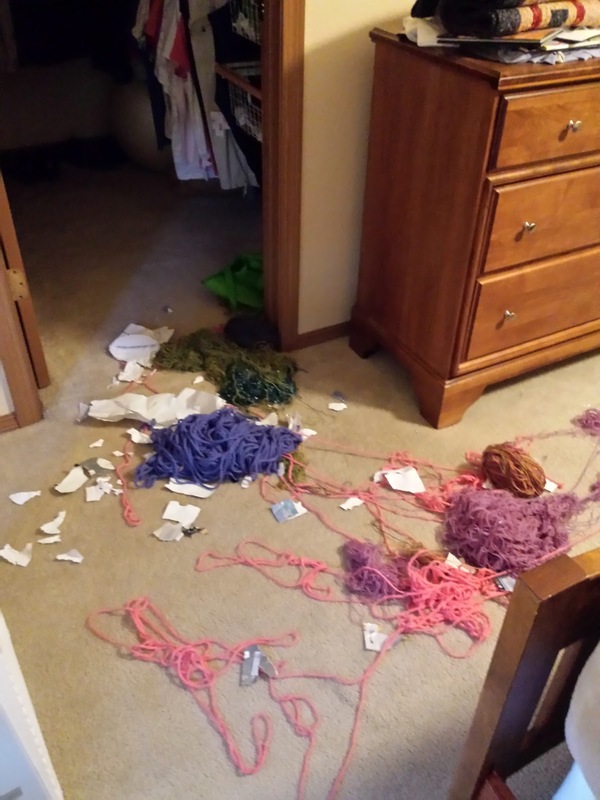 Can you believe Hubby actually thought maybe the cat started this mess???!!! No way! I caught Gracie red-handed! Recently my sister came in from Colorado for 2 weeks. She always times her visits for Rosemary's Tips & Techniques and, if possible, for a guild meeting and possible class. This month we had Paula Nadelstern lecture and teach a class at guild. 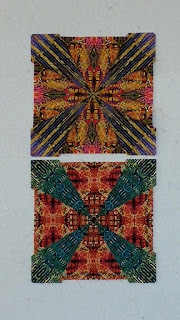 She is a whiz on kaleidoscope quilts. Below are my sister's and my blocks. Looks like something from Woodstock at this point! Hahaha! My sister also joined me for four days at quilt retreat at Kinderhook. What a fun place to sew and celebrate sisterhood & friends! I've been working hard on my guild's Block of the Month. Got the top put together at retreat and needed to audition my finish. I think I've got the final plan in my head and am waiting to get a little time to finish. That's why I joined Sugarlane's Friday Night Sew-In! I hope to also put in a little more time on my APQ March UFO Challenge this weekend. 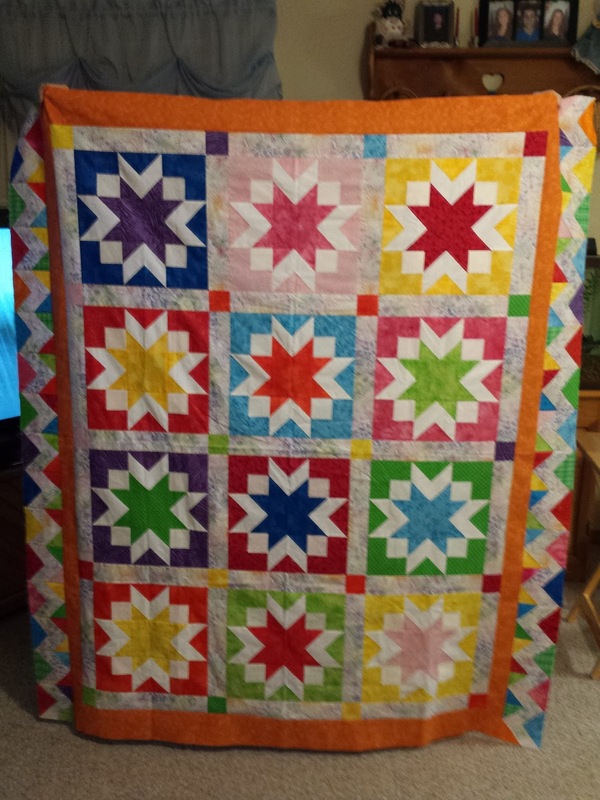 At Kinderhook I got 16 blocks done but would be so proud of myself if I could get the final 14 finished before the end of the month. Wishful thinking probably but it doesn't hurt to dream! Anyway, I'm fairly active with The Loopy Ewe knitting challenges. Each month there is a stash buster challenge for one thing. February was to use up either the last yarn added to the stash or to knit up the last pattern you bought or saved on Ravelry. I chose the last added pattern -- these Geierwally socks by General Hogbuffer (who comes up with these names????). 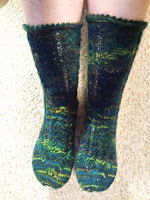 The yarn was dug up from somewhere in my stash, a beautiful Mountain Colors Barefoot in Peppergrass. Lovely! The Loopy Ewe also has an academy and I'm in my Sophomore year, 2nd semester. I love the challenges it presents. This semester goes from February 1 to May 31. 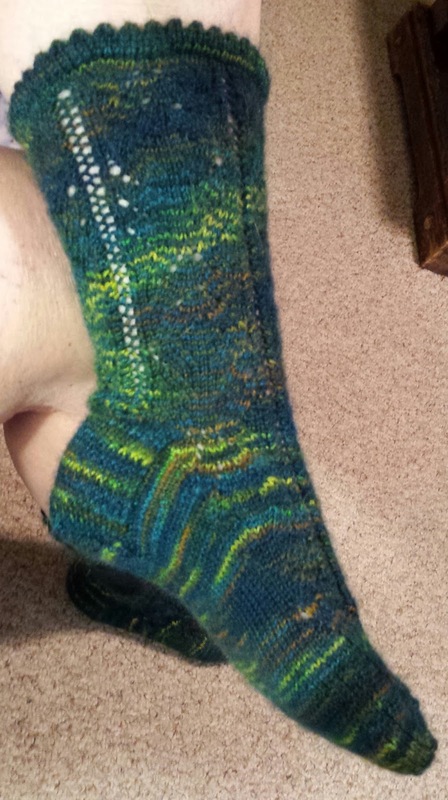 Requirements include a project with twisted stitches, a project with 2 colors, and any sock pattern with a new-to-you technique. 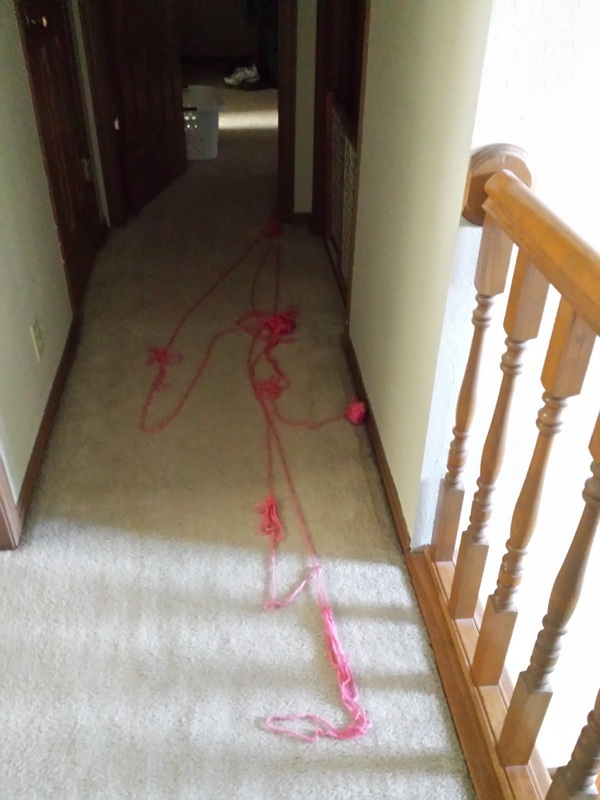 I've started my Twisted Stitches project and will share later. As you know from one of my previous posts, I'm also working hard on my All People Quilt UFO Challenge. The February UFO project was this one and I'm so desperately close to finishing it, when I get some spare time I will be finishing this one up. It is a Lynn Hagemeier design and has been so much fun to work on. Her technique is not so much piecing but layers ... a technique she calls Layers of Love. This pattern is actually in her "Layers of Love" book! 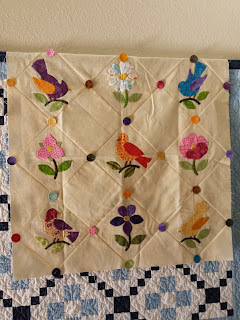 Obviously I chose to not use Lynn's Kansas Troubles fabrics but go off in my own direction. I'm known to do that! You see the two outside pieced borders? 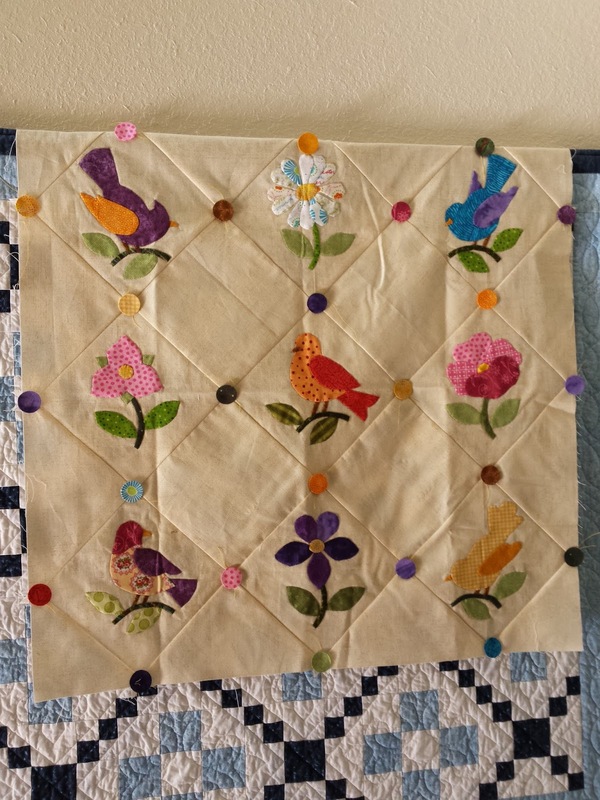 The top & bottom pieced borders are complete and ready to be added with the exception of the corner pieced blocks. 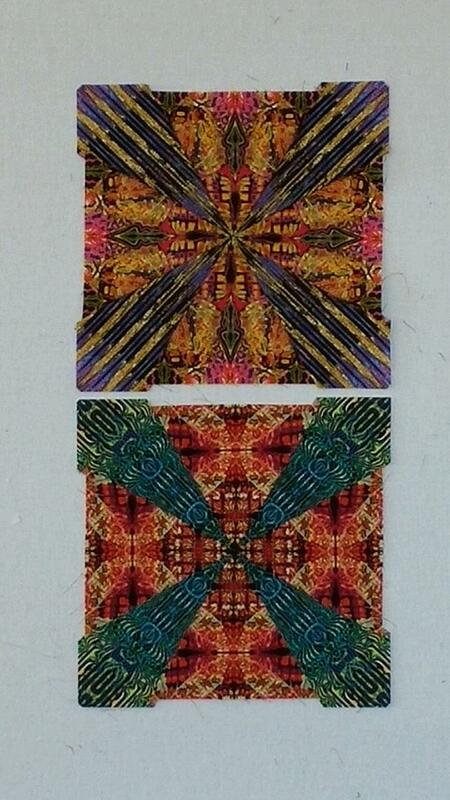 They are pieced using the outside (and final) border which I had yet to purchase. Well, I now have the fabric and am ready to forge ahead!!! Only problem is ... It is now March and time to switch to another UFO. My sister has come to visit from Denver and next week we are off to retreat. I will be taking my March UFO with me and will post my progress on it! I'm tempted to bring the February one to work on as well but it's difficult for me to work on large projects at retreats as I need space, which is usually a premium.